Explore the amazing world of Dolphins when you get up close and personal while swimming with them in the Caribbean Sea. Enjoy an amazing Dolphin Swim Adventure in St. Kitts and learn about the marine mammal environment as you swim with the dolphins. Get personal with dolphins when you swim with the dolphins during your getaway in St. Kitts. Your Dolphin Swim Adventure vacation includes learning about marine mammals, swimming with the dolphins, and watching dolphins perform aerial acrobatics for you. The dolphins will even assist you by pushing you along as you ride a boogie board through the water. 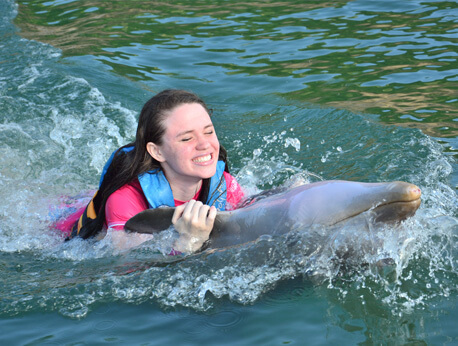 Take a ride with the dolphin as they pull you through the waters of the Caribbean Sea and even take pictures with them while they snuggle up close and give you a kiss. Located just north of the Bird Rock Beach Hotel on the southwest side of the island of St. Kitts, the Dolphin Discovery program provides several dolphin adventures and a learning environment that can help you discover the world of dolphins. The dolphin discovery includes 40 minutes of interaction with the dolphins while in the water with them after going through a 10-minute briefing. The dolphin adventure is limited to groups of 12 people at a time to allow for a closer experience and kids 6 to 12 must be accompanied by an adult. Kids 13 years old and up can swim alone and life jackets are required to be worn during all water programs. Arriving 30 minutes before the start of the program is highly recommended to allow time for a short briefing prior to the dolphin swim. If you have any health conditions or concerns, contact the call center ahead of time for any special directions or information. Please keep in mind that for safety, women who are 5 months pregnant and over will not be allowed to participate in the dolphin adventure. It is recommended that participants use a biodegradable sunscreen as well as bringing meals and towels with you. In addition, be certain to bring along enough cash with you to cover transportation expenses and any shopping you want to do.